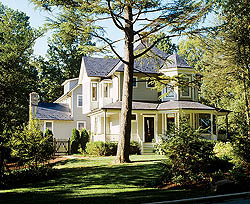 Ken Tate fabricated an intricate, fictional timeline for the life of this new old house in Nashville, Tennessee, based on four historical styles: vernacular, Georgian, Federal, and Colonial Revival. The Main House was built in the Georgian style, while the Ionic portico and elaborate entrance door reflect the Federal period. Today&apos;s traditional architects are often asked to blend many different and even disparate elements to create an authentic-looking new old house. Putting all the pieces together can be a challenging architectural puzzle. When Louisiana architect Ken Tate began a house for a client in Nashville, Tennessee, it was a bit more like a Rubik&apos;s Cube, especially as the pieces had to fit both from the outside and from within. "At first the client wanted his home to look like an eighteenth-century Greenwich, Connecticut, house," Tate explains. "That was fine, but then it became more complicated. For instance, he wanted a big kitchen with a breakfast room and sitting area. Well, how do you do that in an eighteenth-century style? A real old house might have a little butler&apos;s pantry but not a big kitchen." To help solve this intricate puzzle, Tate began by inventing a story outlining the changes that might have been made to such a house over 270 years, reflecting current styles through the passing of time. Tate&apos;s complex tale begins in 1690 with the hypothetical construction of a small storage barn of Tennessee fieldstone, followed by an early Colonial house, circa 1725, that burned down 30 years later. The house was then rebuilt on the same foundation, a carriage house was added, and the barn was converted to a detached kitchen. Updates to the house in 1803—Tate theorized—included the addition of a new Federal portico and bedroom wing and the renovation of the Georgian dining room in the Federal style. Tate imagined that the Colonial Revival porch was added across the back of the house in 1904. The carriage house would have been converted to a garage around 1920. A shed dormer added in the 1930s created space for an artist&apos;s studio that was subsequently converted to servants&apos; quarters, and then an exercise room in the present day. For each stage of the home&apos;s simulated progression-for each piece of the puzzle—Tate created detailed elevations and floor plans—even of the house that burned. Why did he establish such an elaborate and detailed timeline? "I had used a narrative many times in the past without the client&apos;s participation," Tate says, "but this time the client suggested it, and it worked particularly well." Simply put, designing the home in four distinct historic periods—vernacular, Georgian, Federal, and Colonial Revival—enabled Tate to fit all the pieces of the puzzle together better. These different architectural styles also create tension, energy, and contrast, and the resulting house is rich with transitions of scale and style, from petite to massive, from primitive to refined. 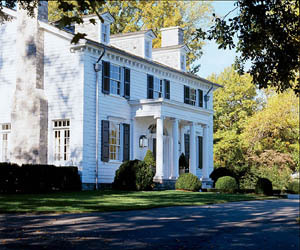 The massing of the blocky Georgian main house, for example, is lightened by the more refined Federal portico. The vernacular stone building&apos;s 6-inch columns are flanked on one corner by a large classical column of visual complexity. Outside the Federal dining room, a colonial stairway winds upward, and when taken together, these details form a complete picture of a house that grew over the centuries. The homeowners wanted a large kitchen for entertaining. Tate divided the space into an eating area and a food prep area. The kitchen&apos;s island offers loads of storage and preparation space as well as an additional sink. 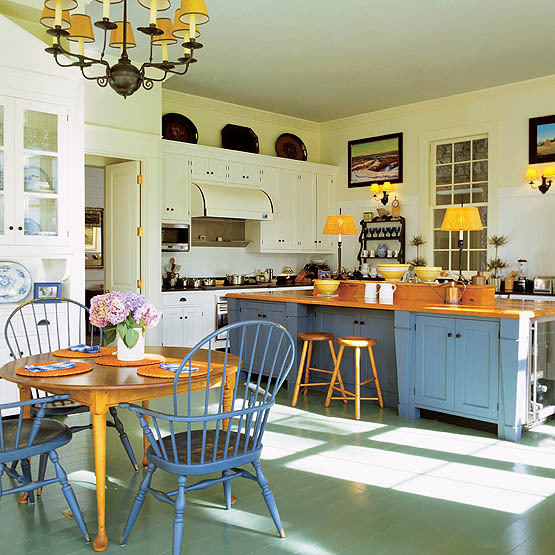 The island countertop is finished in a warm wood tone while its cabinets are painted a Colonial blue. Another piece of this intricate puzzle was the house&apos;s intended size. An eighteenth-century house might have been 3,000 feet at most, but this was to be 10,000 square feet. To make this large house better fit a historic envelope, Tate needed to make it appear smaller. For example, the simple Federal bedroom wing looks small, but it&apos;s an illusion. "This is where the scale of the house really catches you off guard," Tate says. "When you go into it, you expect it to be little, but instead there&apos;s an elegant 1920s-style bathroom with a white marble floor and barrel-vaulted ceiling with an ellipse at each end. The room runs crosswise—not with the roof ridge—so that the entire vaulted ceiling is still below the exterior eave line." From the street, the finished house appears half its size. "It&apos;s because of its proportions and scale," explains Tate. "The massing of the house is big, but the windows are big, too, so it doesn&apos;t look overscaled." Tate believes that an understanding of proportion is hard-wired in the human species. Consider the ancient mathematical principal of the Golden ratio. This inherently pleasing formula was used by architects in ancient Greece, Egypt, and Rome to construct some of the world&apos;s most famous and harmonious structures, and it found its way into Tate&apos;s plans almost subconsciously. "We didn&apos;t even know we had Golden ratio proportions in the front of the house," he says. "We took the drawing of the front elevation and put the calipers on it and discovered the dormers, windows, and door columns were based on the Golden Mean." If he didn&apos;t mean to do it, how did it happen? "It&apos;s inside all of us," Tate replies. "I don&apos;t use it as a measure; I just eyeball it. The Golden Mean is in the body, so it&apos;s in us and everything we do, unless you&apos;re a modernist," he laughs. In the "oldest" section of the house, details reflect the Georgian and Federal styles. The hallway offers wonderful Georgian arches complete with keystone detailing. Tate&apos;s design also needed to harmonize from the inside, particularly as the client requested enfilades, with spaces opening onto each other to create clear views from front to back. To address this part of the puzzle, Tate designed wide hallways—more like rooms—along the axes of the house from front to back. 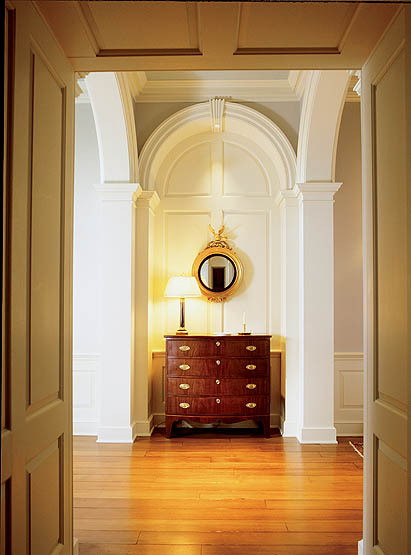 With no other function but to surprise and delight, these hallways are the client&apos;s favorite part of the house. 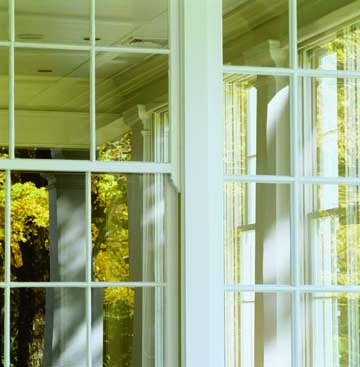 Enfilade is used all over the house, with doors opening into room after room to reveal long views out the windows. The final picture created by Tate&apos;s complex puzzle is a new house that appears authentically old. "This house is really low-key; it never gets in your face with its &apos;oldness,&apos;" Tate says. "The detailing, the proportions, the spaces, the hardware, all these were designed to make the house feel old. And again and again people tell the client, "&apos;I love your old house. When did you renovate?&apos;" Such a response is a clear indication that architect Ken Tate succeeded in making all the pieces fit. Kathie Friedleyis a freelance writer living in Virginia.